The 2001 InterClub Midwinters held at Severn Sailing Association on February 10-11 was a resounding success. Some of the best frostbite sailors in the northeast and mid-Atlantic region gathered for the annual event, with a few guest “rock stars” sprinkled in adding to an already eclectic mix. Conditions were trying for the 24 teams of sailors and race committee alike on Saturday, with westerly winds blowing from 15-25 knots. The shifty and gusty nature of these winds made staying upright the priority, and approximately one dozen crews took a dip in the 30 degree Chesapeake waters during the day. The winds on Sunday were ideal at 10-15 from the northwest, but an early 0930 start and colder temperatures gave real meaning to “frostbite” sailing as ice formations on sheets and hardware were common. Pline is referring to the regatta format – dubbed “collegiate style” by the regatta organizers. Sailors form a team by having two separate crews in each boat, one crew sailing the “A” division and the other sailing the “B” division. Only one crew is on the water at a time, giving the other crew a chance to warm by the fire in the clubhouse, eat a hot snack, and talk with friends and competitors. Unlike all other midwinters regattas, this one is run smack in the middle of winter and in a cold mid-Atlantic climate. For frostbite sailors, cold is relative. 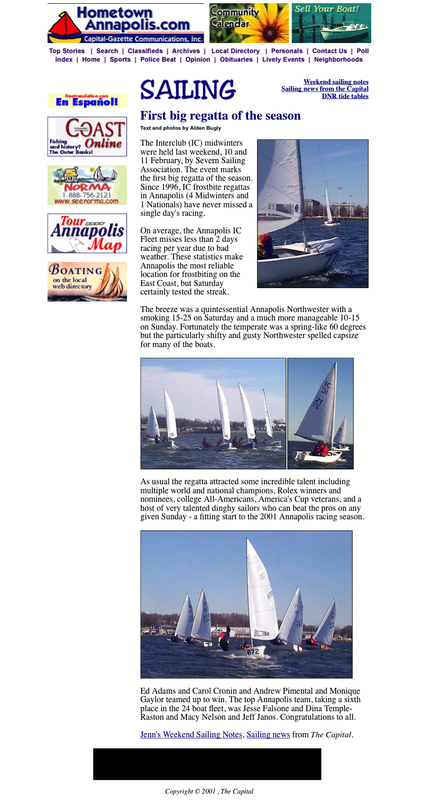 Annapolis is the southern-most InterClub frostbite fleet, and the sailing area here rarely freezes, although a northerly blew the ice out just in time for the regatta last year. In Rochester, NY and Hyannis, MA frostbiters usually stop sailing in January and February, and wait for the thaw in March before continuing. Rochester frostbiter, Ryan Walsh, says “we rarely get above freezing when we sail, and we were racing around ice floes and through the slushies in the Genesee River during the fall.” Other fleets like the Larchmont, NY and Winthrop, MA frequently ice over causing weeks of cancelled sailing, so traveling to “balmy” Annapolis is a welcome change for those frostbiters used to rigging their boats with a pick-ax. For the second year running, the Newport, RI team of Ed Adams, Carol Newman-Cronin, Andy Pimental, and Monique Gaylor won the event. Mr. Adams is ubiquitous in the sailing world, having recently coached Mark Reynolds and Magnus Liljedahl to their Olympic Gold in Australia. Ms. Cronin is an active Snipe sailor and match racer, and was recently recognized as a nominee for the Rolex Yachtswoman of the Year. Mr. Pimental owns a small boat building business, and often teams with Ms. Gaylor (New York, NY) for big events. Annapolis sailors didn’t fair so well, with the top team finish going to Jesse Falsone, Dina Temple-Raston, Macy Nelson, and Jeff Janos in 6th place. Professional sailors from Annapolis Andy Horton and Terry Hutchinson took a break from their busy schedules to compete, finishing 6th and 7th respectively in B division showing the depth of talent in the IC fleet. The Annapolis InterClub Fleet would like to thank our suppliers; Phillips Seafood, The Bagel Connection, Fawcett’s Boat Supplies, UK Sails Annapolis, Kinder Industries, Harken, Guck, Inc., Ronstan, SpinSheet Magazine, Sailing Magazine, Layline, SailingCentral.com and Riff Raff Graphics.